Hello and welcome to The Good Things! August has flown, hasn’t it? 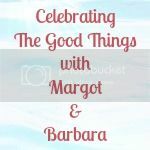 I’ve barely had time to blog at all—you might have noticed that The Good Things was missing last week. Though, it was expected and I’m glad I’ve had a little break. Over the past few days, the cooler weather, the sudden appearance of blackberries and elderberries, the early falling of leaves, are all contributing to it feeling distinctly autumnal (in August!) though I’m fearlessly still wearing sandals and eating ice cream in a last-ditch attempt to cling onto summer. I’ve had a lovely August and very blessed to have so many things that I could choose to be My Good Thing this week. My Good Thing #9 – Portraits. During our holiday in Whitby I started to get to know my new camera a bit more. Thankfully, I had two very willing portrait subjects in my children, one not-so-willing subject (sorry Mum!) and plenty of opportunities to capture a few portraits. I’ve always enjoyed snapping away with my camera phone, but it’s an absolute joy to be spending more time photographing my two beloved children and recording their lives. I rarely put pictures of them on my blog but I decided to make the exception this week. These photos are obviously all completely un-edited. I know there’s a lot of improvement to be made on my photography skills but although I am planning to learn more about editing and Photoshop in particular, I don’t want to create images that are fake (and that’s without even entering into the conversation about how much damage over-Photoshopped images have done) . I am totally biased but I think that they have such lovely faces that they should stay just as they are, complete with chocolate smears, nearly-but-not-quite faded chicken pox marks, and the grimace that appears when you ask a five year old boy to smile for the camera! This linky is a place for all your happy posts, old or new. Simply click on the blue button at the bottom and add your post. If you’d like to, you can grab the code below for the button to add to your own blog post to show you’ve joined in. You need to put this into your ‘text’ or HTML version of your post. It’s a no-follow link so won’t upset Google! Please take some time to have a look at other people’s posts too, before and after your own link, leaving comments and sharing the blog love. I’m looking forward to reading your posts! Best. Faces. Ever! I’ve been looking through lots of old postcards this week, many of which had black and white portraits on them. I find it so inspiring, I’m almost desperate to catch the ‘essence’ of grainy old purity that make those old images stand out as so different to me – Photoshop here I come ! Manneskjur recently posted…68. How Does Your Garden Grow?